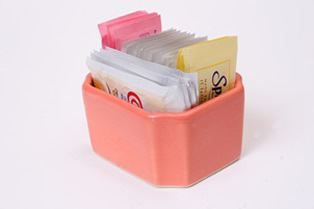 Will artificial or low-calorie sweeteners help you maintain your weight or not? I don't know if you know this, but in the late '70s and '80s there was a theory floating around that artificial or low-calorie sweeteners actually promoted weight gain. The theory was that they altered taste and metabolic signaling, which decreased the feeling of fullness and increased appetite, hunger, sweet cravings, and ultimately food intake. There was very little data to support the idea, but that didn't stop it from making headlines in various health magazines. In fact, many people still promote this idea. But is it true? Well, I'm happy to tell you that just a few months ago the controversy was finally put to sleep. The authors of a new meta study published in The American Journal of Clinical Nutrition looked at every single study they could find that examined the effect of low-calorie sweeteners on weight. In the end, they came up with 24 different studies. Nine of them simply followed people over time and compared their intake of low-calorie sweeteners with their weight. These are the least reliable kind of studies. The other 15 studies were randomized, controlled trials. These are the best studies because they are controlled and compared the low-calorie sweeteners in one group to a placebo in another group. You might be surprised with what they found. First, the randomized, controlled studies. In every study, there was a statistically significant but extremely small decrease in all the measurements. On average the people using the low-calorie sweeteners lost a little more than two pounds of fat and a little less than 3/8" around their waist. Not much to brag about there. In the other studies, there was no significant change in either weight or waist size. So what are we to make of these results? First of all, I think it completely settles the theory that low-calorie sweeteners can actually result in weight gain. That just doesn't happen. Second, if you want to get a better handle on your weight, you are not going to do that by simply substituting low-calorie sweeteners for sugar. The gains are way too little. You are going to have to do more than that. So is there a place for low-calorie sweeteners at all? Sure there is. People are different. There are some people out there whose bodies can tolerate sugar. But most Americans can't. And for many Americans, sugar is nothing less than poisonous. For them, even a modest amount of sugar can be a problem. And low-calorie sweeteners can give them the enjoyment of something that is sweet without all the negative repercussions. But there are two last points I want to make about low-calorie sweeteners. First, not all low-calorie sweeteners are the same. The low-calorie sweeteners called “sugar alcohols” are naturally occurring. And despite the fact that they can be intensely sweet, some of them have been found to have significant health advantages, such as decreasing tooth decay, enhancing the immune system, and decreasing the risk of osteoporosis. Common examples of these sweeteners includes: erythritol, maltitol, mannitol, sorbitol, and my favorite xylitol. I like xylitol the best because it tastes great and unlike the other sweeteners doesn't upset the intestines and cause gas. The other low-calorie sweeteners in this study are the artificial sweeteners such as aspartame, saccharin, and sucralose. I am not fond of these substitutes because they are not natural to our bodies, they don't taste good, and they can cause problems for certain sensitive people. So try to avoid these as much as you can and stick with the sugar alcohols or stevia, which is an herbal extract. Miller PE, Perez V. Low-calorie sweeteners and body weight and composition: a meta-analysis of randomized controlled trials and prospective cohort studies. Am J Clin Nutr. 2014 Sep;100(3):765-77.